Kirjurinluoto is an island and a park in the delta of Kokem�enjoki river in the city of Pori in Finland. 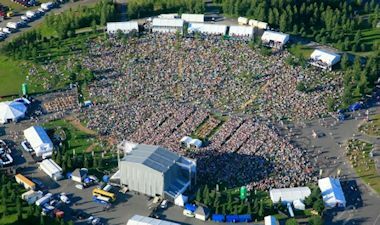 It is best known for the Kirjurinluoto Arena, an open-air concert park which hosts the annual Pori Jazz festival. Bob Dylan performed the last day of the festival. 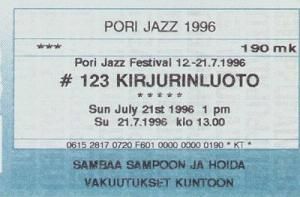 Programme of the festival, 12 pages. Thank you to Peter Koehler for the scan and information.